Legislators have been preparing for several months to return to the Capitol in January for the 2019 legislative session. As part of that preparation, I invited some of my colleagues to our area to learn directly from local officials about issues important to North Central Washington. I was proud to help host recent visits and discussions with senators on energy and transportation issues. While I had hoped certain colleagues and staff would be willing to visit our area, I was pleasantly surprised with how both opportunities came together. What I wasn’t surprised about was how well our local officials did at articulating the issues important to us and describing the uniqueness of our needs. Senator Reuven Carlyle, Chair of the Senate’s Energy, Environment and Technology Committee, and I discuss energy issues with Chelan County PUD General Manager Steve Wright during our Rocky Reach Dam tour. Members and staff from the Senate Energy, Environment and Technology Committee gathered together with nearly 40 statewide stakeholders to discuss a variety of energy issues important to our area. I’m proud to serve on this committee and am thankful that Chair Reuven Carlyle and Vice Chair Guy Palumbo both attended, along with longtime public power advocate Sen. Tim Sheldon and senior committee and caucus staff. Special thanks go to our local PUD general managers Steve Wright of Chelan PUD, Gary Ivory of Douglas PUD, and Steve Taylor of Okanogan PUD, who helped provide local insight on energy and broadband issues. 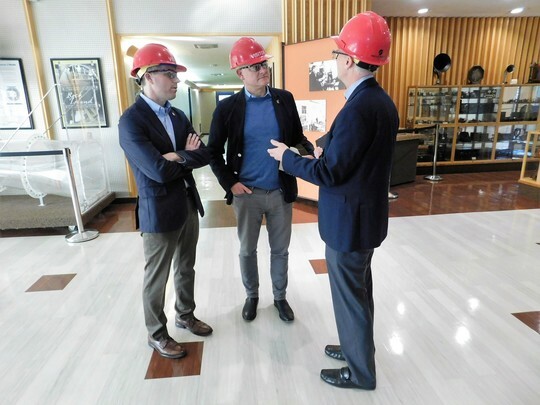 Following the extensive discussions in the morning, my fellow senators and staff colleagues toured Rocky Reach Dam, where we learned about hydro efficiency and experienced the insides of one of the world’s best hydropower projects. After the hydro tour, our group visited Link Transit to learn about its all-electric bus fleet – the state’s largest – powered by our renewable hydropower. Local officials discuss the proposed $113 million Confluence Parkway Project with Senate Transportation Committee Chair Steve Hobbs. 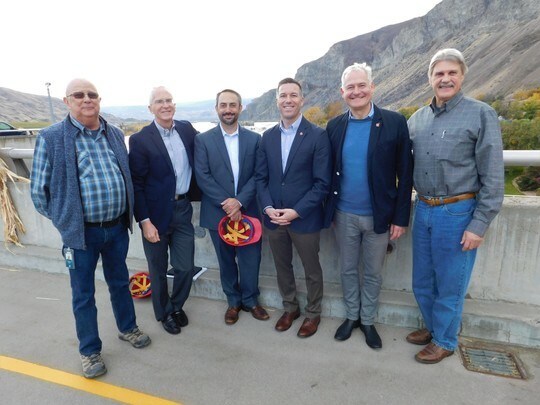 Pictured from left to right: Jeff Wilkens of the Chelan-Douglas Transportation Council along with City of Wenatchee’s Steve King and Wenatchee Mayor Frank Kuntz. 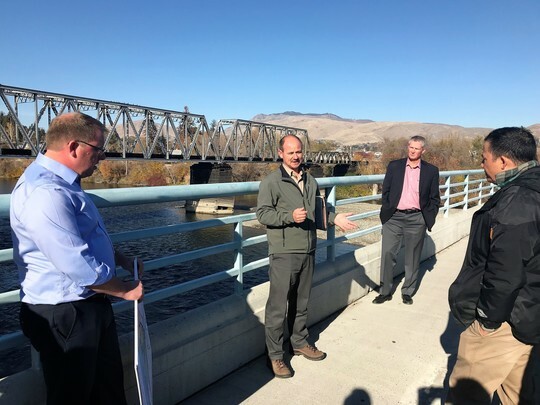 My colleague Steve Hobbs, chair of the Senate Transportation Committee, visited the North Central Washington region over two days in early November to learn more about our regional transportation needs. Among his many stops included a discussion with staff at the regional Department of Transportation office, a Chelan-Douglas Transportation Council meeting, and a tour of local transportation priorities. The tour included Representative Mike Steele, Representative-elect Keith Goehner, Wenatchee Mayor Frank Kuntz, Chelan County Port Commissioner JC Baldwin, Regional DOT Administrator Dave Bierschbach, Transportation Council Executive Director Jeff Wilkens, Link Transit General Manager Richard DeRock, and other local officials and staff. We discussed the proposed $25 million McKittrick Street Railroad Underpass, $21 million Wenatchi Landing Interchange, $4 million South Wenatchee Apple Capital Loop Trail Connection Bridge, and Wenatchee’s $113 million Confluence Parkway Project, along with a presentation about Link’s electric bus fleet. I could not have been more proud of how well our ambassadors did in working together to develop the tour, detail our local transportation priorities, and put our best effort forward describing our needs to the Transportation Committee chair and committee staff. Regardless of what legislation advances in the upcoming session, good things come from all of us working together to build relationships and advocate for our region. Special thanks to Chelan PUD for providing our tour at Rocky Reach Dam. Pictured from left to right: PUD Commissioner Dennis Bolz, General Manager Steve Wright, Senator Guy Palumbo, myself, Senator Reuven Carlyle, and Senator Tim Sheldon. Anytime key legislators are willing to learn about our priorities is good for our community. I’m grateful for the positive relationships that I have with my Senate colleagues on both sides of the aisle and for their willingness to visit our area. I am also grateful to serve our community alongside so many talented and hard-working local officials and staff. Together, we can continue to do great things. Thank you for the opportunity to serve you as state senator. Thank you for reading this e-newsletter -- I hope you will stay connected and continue receiving my updates from the Legislature and the state Capitol. To stop receiving my updates, simply follow these steps: 1) Click here, enter the e-mail address that received the newsletter, click "submit," and 2) when a new page appears click "delete my account." You will receive a confirmation e-mail. You may also stop receiving my update by sending an e-mail to my office (brad.hawkins@leg.wa.gov). If you have questions or problems with this subscription, please visit subscriberhelp.govdelivery.com. For more news, click here to visit my legislative webpage. It's my privilege to serve the people of Washington's 12th Legislative District, comprising all of Douglas and Chelan counties and part of Okanogan and Grant counties.